A few days ago, I awoke in the middle of the night to a rich variety of trills (no spills) and warbles. It was one of my favorite songsters, the mockingbird, who loves to serenade his lady love in the dark of night, much to the chagrin of some folks. Since I’ve grown up with the mockingbird’s tunes, I enjoy them anytime of day or night. The mocker is a tidy, trim bird, which can sing his own song (although I am not sure which is his own) as well as mimic many others. Some experts say some mockingbirds can imitate up to 200 other birds’ songs as well as some non-human noises, such as sirens or cats. I don’t know about that. Every time I try to count a mockingbird’s songs, I max out about 9 or 10 because I lose track of what I’ve heard before. I love to watch and listen to them as they make their way through the day. The Cerritos mockers love to perch on something high, such as the top twig of a tree, the highest gable of a house or a light post. They don’t like crows, cats or hawks and will chase them alone or sometimes in tandem. Our ol’ cat, Bert (from many years ago), literally crawled on his belly across the street to get home when a pair of mockingbirds were chasing him. He couldn’t get inside the house fast enough to escape their torment of plucking his short hairs and beak nips. I think the crows might like to get into the mockers’ nests because they will chase crows in flight. It’s amazing to me that neither the mocker nor the crow ever run into anything while the pursuit is going on. I’ve even seen a crow do a barrel roll in an effort to escape those sharp beaks. not to even put my tongue on one which I took for the Gospel) and the mockers love them. They land on the block wall and hop down to one of the branches to gobble up as many peppers as they can. They try to be sneaky about it, but every time I see the bushes wiggle some, I know it’s them. 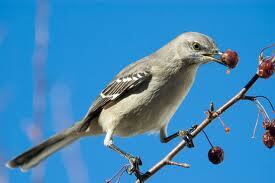 This picture is of a mocker eating a crab apple, but the effect is similar as one eating my bird pepper bush. I had always heard that it was only the male of the species that sings, but the National Geographic Field Guide to Birds claims otherwise. Both sexes sing in the fall to claim feeding territories. 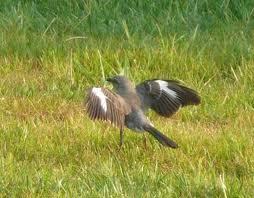 movement is called a wing flash. A Wikipedia article says it might be to cast a different shadow on the grass so as to fool insects or whatever the prey may be at that time. I guess that makes sense, but I like my thought better. They are saucy birds and I think they’d like to make themselves look bigger. I wish I had taken all these pictures, but I never have the camera at the right moment nor do I have the skill or patience to get shots like these. As I was outside this morning doing some weeding, I was treated to quite a symphony by mockingbirds, finches, sparrows, phoebes, a few warblers and even some starlings. Some people might think all the songs are a cacophony but I choose to think they are a symphony because they were all blending into happy, contented sounds of creatures carrying on their lives without bothering each other or worrying about who has the correct religious or political viewpoint or who has more money than the other. While I don’t particularly enjoy weeding the yard, I do really enjoy being outside listening to and watching God’s creatures. Some have asked me why “Buzzard Notes.” That’s a fair question and I’d like to explain how this blog title came about. When I finally got enough gumption to figure out how to do this thing and got some good information from Güd Writer who also has a blog on Word Press, I began to tinker with this thing. One of the first things they ask you is what you want to call your blog. I tried “cora” with many variations and numbers along with “cjohnson” and many of its variations. They were all taken. What to do? Periodically, I add some little tidbit of something that interests me and post it (Please realize that many things interest me and I love to share them, but time, sometimes, is of the essence) So if you are interested in being alerted as to when a new post comes along please look for the small “follow” box in the bottom right hand side of the latest post. If you click on that, it will ask you for your email and then you should be alerted as to when the latest posts happen. 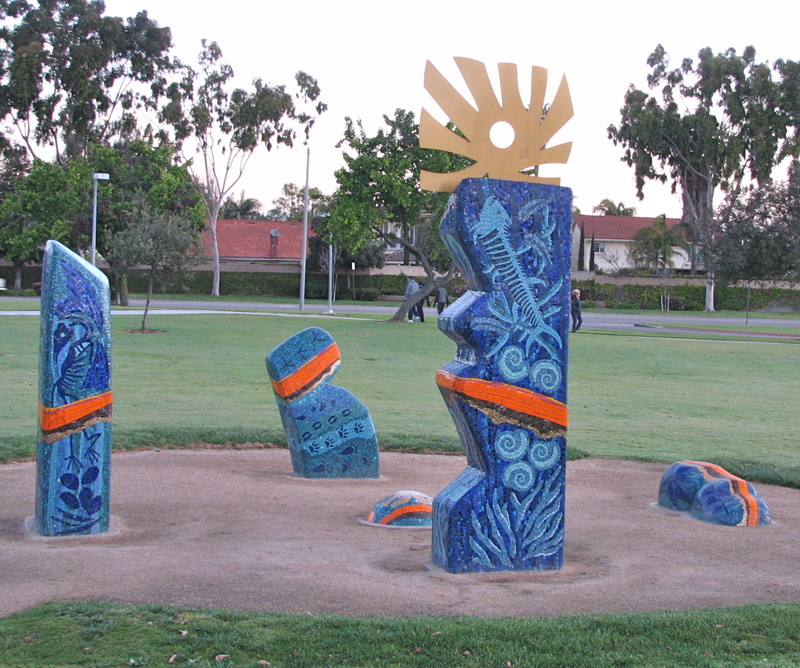 Today is a gorgeous day in Cerritos…a bit too warm with 89° but nice, nice the less. No smog or haze and a slight breeze. 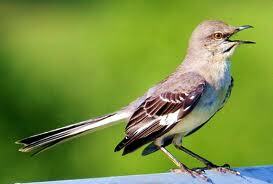 I was outside talking to one of the neighbors when I noticed a mockingbird was serenading us with his many songs. I’m sure he’s trying to attract a mate as he just kept on singing with hardly a breath. I know it was a male mocker because it’s only the males who sing the many tunes. I enjoy hearing them because it reminds me of spring days of yore…many birds singing their tunes with seemingly no cares, blooming flowers galore and a nice feel to the air. Life is good! had risen higher. Well, I couldn’t wait that long and so I’ll just have to rust that this really happened. I don’t know if it ever does because I’ve never seen an article in the newspaper or online about this little piece of trivia. 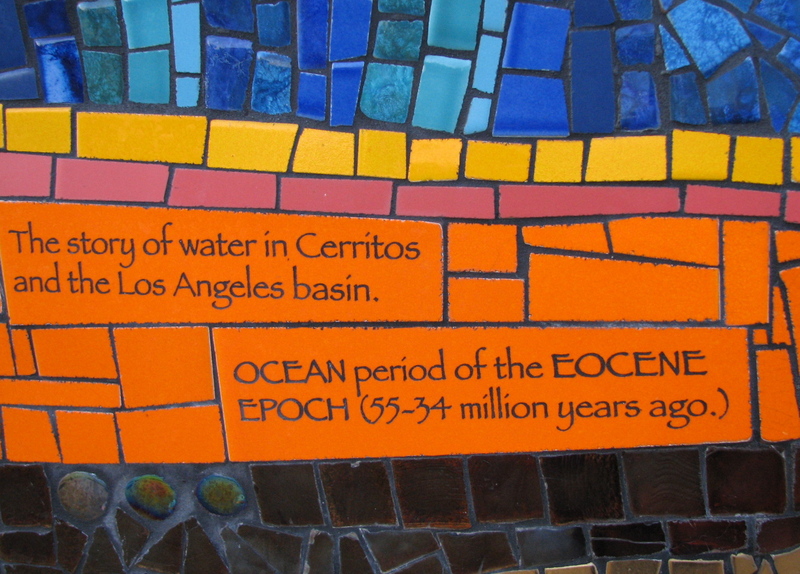 The smallest piece of Water Henge represent an 11,000 year drought 10,000 years ago. And we think we’re in a drought now after a year or so! 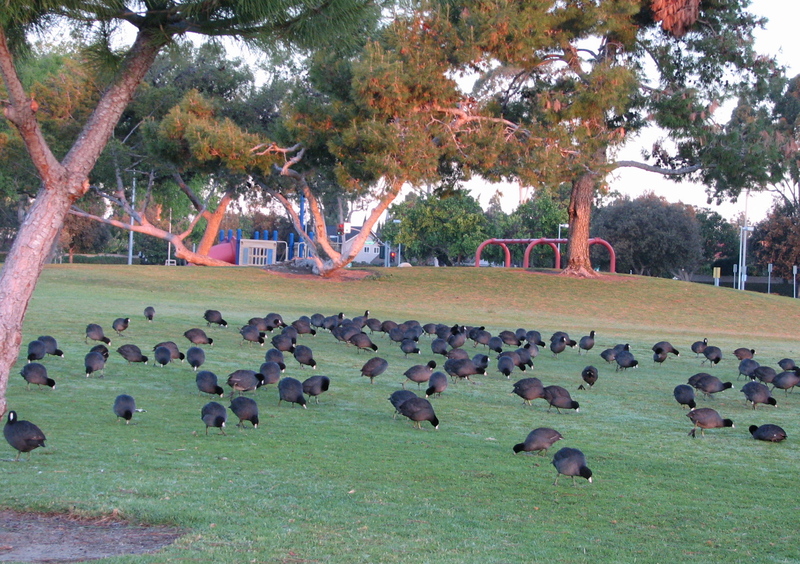 After being a bit disappointed in not seeing the sun shine, I continued my walk around the park and took a picture of a large flock of coots (what Dad used to call mud hens). They were “grazing” on the grass, probably leaving their evidence everywhere. Those birds are really messy! Speaking of birds, I’ve seen evidence of several sparrow and finch nests around the house and one of the neighbors told me he has a swallow’s nest attached to his house. Since the birds have completed it, he’ll let them finish out their cycle before knocking it down. Swallows are persistent little birds as they will try two or three times before giving up on a nest if someone knocks down their attempts at building their little mud house. Spring has sprung and hope springs eternal (most of the time) Happy Spring and Happy Easter to you all!